Nukuri, 33, is the second-seeded elite woman entered in the 2018 Lilac Bloomsday 12K on Sunday. With more than a dozen wins in her illustrious running career, she means business. Nukuri is a three-time Olympian and finished 13th in the 10,000 meters at Rio ’16. She competed in the 5,000 in the 2000 Sydney Olympics for Burundi. She returned 12 years later to run the marathon in London, finishing 31st, and was chosen to be the Burundi flag bearer. This is her third Bloomsday and, as a fan of the course, she’s looking forward to its challenges. “That hill,” being Doomsday Hill, of course. The challenges of the course will only be part of it. She faces off against defending champion Buze Diriba and second-place finisher Mamitu Daska. Diriba and Daska competed to the wire last year as Diriba was able to outkick her fellow Ethoipian at the last. Nukuri acknowledged that a 12K race brings all sorts of elite runners – from short distance to marathoners. So the competition is foremost in Nakuri’s mind. But she also brings a bigger perspective to the spectacle that Sunday’s race is and the importance it holds for the city and the region. Nukuri, who was born in Burundi, escaped the Burundi civil war in 2001 and fled to Toronto. She learned English in junior college while competing, earning nine national junior college championships and 17 All-America honors before attending the University of Iowa, where she won two Big Ten championships – one in cross country and one in the 5,000 in outdoor track. Nukuri was named an All-American three times and left Iowa with school records in 10 events. She became an American citizen in 2017 and now holds dual citizenship. 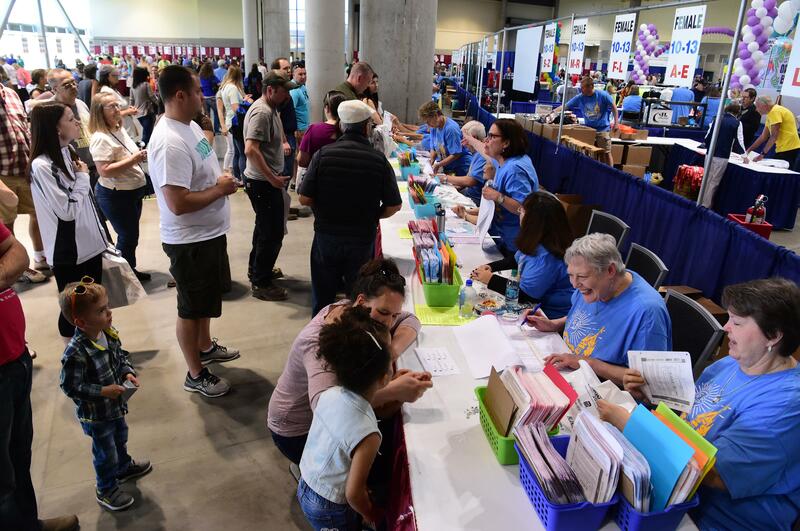 More than 40,000 participants are expected for the race, and the elite runners in front of the pack are just a small portion of those that will lace ’em up this weekend. Event organizer Don Kardong explains the magic that is Bloomsday. “I think Bloomsday, we try to cover the whole gamut,” he said on Thursday. “We try to have – and we do have – the best runners in the world, the best wheelchair racers in the world. “But I think for most people on Bloomsday they like to come out with their families and friends and just try to enjoy the day. We have more walkers than runners, but the runners we do have, some of them are pretty serious. Elite runners coordinator Jon Neill concurs. “We’ve got 50 percent of our participants that walk,” he said. “I think that’s another great feature of our race, is that it’s not a race – it’s a community event. And this is a chance to see our gorgeous town and go along such a scenic course. Nuruki said the pros notice. “I think that’s why I love the road races,” she said. “The Olympics, all those things, are exciting, but (in road races) you also have people who have jobs, who have kids to take care of, but still find the time to get out there and run. “They always come up to us (the elite runners) and say, ‘You guys are amazing,’ but no, no, not at all. We train all the time – this is what we do, what we do all day. I find it really amazing to see people out there in their 70s, young kids, college kids – I think that’s more amazing. Nukuri mentioned how much she has enjoyed coming back to Spokane, a city she might not have discovered were it not for the Bloomsday race. “When you get to come to a race that has professional runners, runners from different races and different countries, it’s nice to be able to interact with people from different backgrounds and different countries and different races,” she said. “You don’t always get that kind of opportunity, especially being in kind of a smaller town. I hope (Spokane) embraces it. (The professionals) definitely do. For us, it’s also different experience. Published: May 5, 2018, 5:24 p.m. Updated: May 5, 2018, 6:13 p.m.